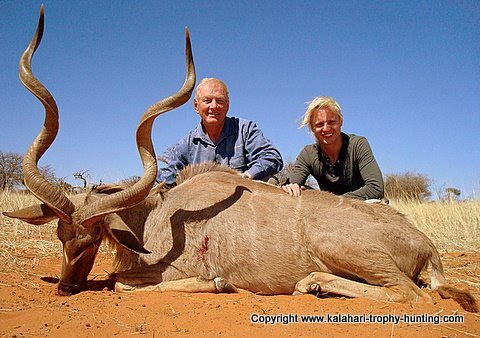 An Africa Hunt review: John Palffy and his son Richard from Australia hunted on Uitspan Ranch, Namibia in September 2008. 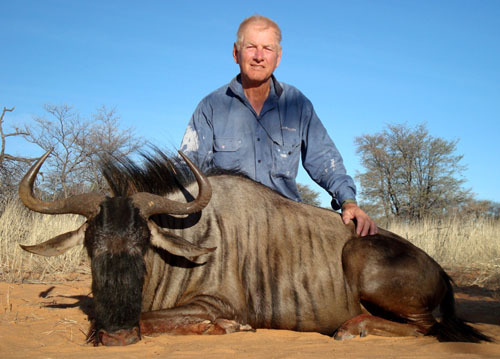 John wrote this detailed review of their hunt and time in the Kalahari. "In 2007 there was a hunting show held in Wodonga, Australia. I went along as lots of others did. As someone who grew up and had spent half a lifetime on a farm I had hunted small game, but not in recent years. 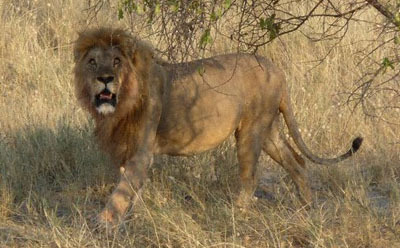 The show gave me the idea that I may be able to do the improbable... hunt in Africa. I spoke to some people at the show, picked up lots of printed matter and came to the conclusion that Namibia was the place to go. The political climate was stable and costs seemed the most reasonable. With the agreement of my wife Pam, I launched into doing some serious research and fact finding. I took over HER computer and went into Google. There were seventy seven pages of adverts to hunt in Namibia. After weeks of looking at sites, I chose this place called Uitspan in the Kalahari on the border with Botswana and one hundred kilometres from the nearest town, Aranos. With modern technology I sent an email to Uitspan with an inquiry on the possibility of booking a hunt with them. I listed my 3 animals that I wished to hunt, being Kudu, Gemsbok and Impala (this later blew out to five animals adding Springbok and Blue Wildebeest). 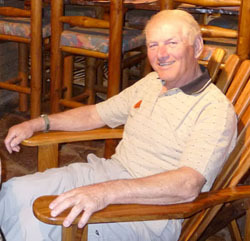 I received a prompt and informative email from Michael Duvenhage, the Professional hunter and his wife, Tienie. Tienie is also a qualified Master Hunting Guide. They were able to offer the game that I wished to hunt and I would be welcome (WELCOME should be in large letters as the hospitality was unrivalled by anything I have experienced). Now this email was really exciting and the anticipation began to mount from here on, even for me who is not the excitable type. With a few more emails and a deposit paid, the trip was set. I made airline bookings flying Singapore and South African Airlines, leaving Melbourne via Singapore, Johannesburg and Windhoek. (I would not choose this route again preferring a more direct flight from Sydney to Johannesburg via Perth e.g. fifteen hours in Singapore and twice overnight in Johannesburg is unacceptable). 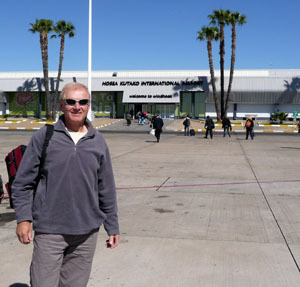 Richard, my son and I arrived in Windhoek in mid September and were met by Michael and Tienie at the airport. We could not have missed Michael in the crowd even without the sign he was holding. He was head and shoulders above everyone else. Tienie looked small, but she has a real presence and loses nothing by her size. After our introductions I felt very comfortable as if I knew these people from early times. Perhaps it is the bond hunters have that give this feeling. It is forty two kilometres to Windhoek from the airport and we saw Baboons in the wild and the realization that this was Africa was starting to set in. The countryside was dry. I had seen dry country in Australia but not like this. There was a wildness about it. After some shopping and coffee we saw some Himba women in the City Park, selling the usual souvenirs. These people were stunningly different, covered in the red ochre paint. (Later on our camping tour with Thimbi Thimbi we visited a Himba Village in the North West of Namibia). We drove to Reiser Taxidermy, about twenty kilometres out of Windhoek and saw the huge and stunning mounted animals he has at his workshop. To say the display is just awesome does not do it justice, you have to see it to understand. 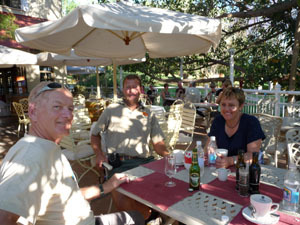 We then went to our accommodation in a guest house, organized by Michael and Tienie. It was nice, comfortable and friendly. That night we were treated to a great dinner at Joe's Beerhouse. This place is just fabulous: the food, the décor (all the junk you can imagine from old farming machinery to toilets to bottles... you name it and it is there). Over some red wine (everyone drinks red wine, don't they!!!) and Zebra steak, we got to know each other better. We left Windhoek next morning for Uitspan Ranch. We travelled with a near new Toyota twin-cab Land Cruiser, comfortable and strong. The locals mostly drive these vehicles.We were travelling on a gravel road, wide and well maintained. The view of the countryside was stunning: smallish hills, bushes with thorns, small trees and dry grass. In fact there was very little green, but I am told this all changes after rain and all the plants rejuvenate. We stop for lunch on the roadside. Tienie has all this in hand, can't let the guests starve... ha-ha. Uitspan Ranch is about five hundred kilometres from Windhoek, so we have ample time to talk and I am just so impressed to be in Africa. The temperature is high twenties and low thirties, and this is how it stays for all of our time at Uitspan, except nighttime it is low teens. Our arrival at Uitspan happens when we pull up at a high gate and high fence (about two and a half metres). This is to try to keep game from going to neighbouring farms (Uitspan is about seven and a half thousand hectares). The farmhouse and shedding could be in Australia. It looks similar, with a few exceptions. The three or maybe four metre high chain mesh fence that surrounds the farm buildings and the dining/lounge area has walls on three sides only. This suits the climate, I think. This is the house of Michael's parents, Hendrik and Isabel. Hendrik is about my age, and has a sense of humor that our age group understands. Isabel and Tienie are the controllers of food and everything else except hunting (and I am not one hundred percent about that either) and do such a great job of providing the exceptional food that you really do need the exercise of the hunt. Michael and Tienie and their three children, Maria (good piano player), Jan-Hendrik and Isabel live in another house on the property which is eight kilometres from the main house. Our travel day is not counted as a hunting day, but mid afternoon finds Michael, Richard and I on the property airstrip which doubles as a rifle range. I need to pass my shooting test and this is no joke. Michael is very serious and professional in ensuring that I am a safe handler of firearms and capable of shooting the 30-06 Mauser he has 'lent' me with reasonable efficiency. This professionalism impresses me greatly. I am nervous. Most nervous people talk too much and I know I am doing this, but all is well and after five or six shots from the Mauser at one hundred metres, Michael says "Its alright. You pass." and I am happy with that. On our arrival at the airstrip we saw a young Kudu bull - very impressive for a first timer in Africa. We return to the main house. I am now pleased with myself at having overcome the "firing" test hurdle. Hendrik comes over to Michael and says something in Afrikaans. There are some good Kudu bulls down and around the pan, which is only half a kilometre from the house. Michael says "Let's go" and we are on our way, and not even the first day of hunting. I am excited and nervous etc., maybe give me a double whisky. We walk then crawl. Michael tells Richard to stay and we crawl some more. Richard is going to be the observer for our hunts. He has the camera. Michael spends a lot of time studying at least three Kudu bulls in different positions and we have whispered discussions, as he gives me his opinion on each animal. We then decide on the animal, crawl some more to a domestic fence (they run Karakul sheep). I have a good rest on the fence to shoot from, sitting in the sand. Michael's final instructions are shoot in the bottom third of the chest, distance a bit over one hundred and sixty metres, no bullet drop problems for the 180G 30-06. I have the site picture, squeeze the trigger and the bull jumps up and then runs. Michael says "Good shot. We will wait ten minutes and then look for him." We look and follow the tracks (no blood). We see the bull again, but no shot chance as there is too much bush. The sun goes down and the light beats us. We return to the main house. I am shattered. I could not have missed. The site picture in my mind is still there and it says it's a hit. I think the bullet was deflected by the bushes. I have no other explanation. It is dark. We all drive to our accommodation facilities, five kilometres from the main house and half a kilometre from the Botswana border. The camp consists of three main buildings and a roof high viewing platform. The vista is just spectacular "Africa". The main building has a kitchen, dining area, breakfast bar, table, two bedrooms, toilet and bathroom. Out the front is a BBQ area and oven, sheltered by a brick wall. There are two other accommodation rooms with three beds and a bathroom each. The construction is mainly brick with some timber and a thatched roof for visual impact. This is very comfortable. Tonight's dinner is a forerunner of others to come, prepared by Isabel and Tienie, with Michael doing the cooking of the meat over a wood fire. He is the man with the Barbie tongs. A couple of glasses of South African red, or white as Richard prefers, and mountains of good conversation about hunting and other things, and some more hunting, we eventually head to bed about eleven. What a day! There is plenty of adrenalin running to keep the body mobile, but we need to sleep. I'm sure I hear the choking roar of a lion during the night..
Out of a deep sleep, I am sure I can hear a rooster crowing. It's still dark-ish and I thought all the chooks were at the main house. Then I hear the rooster crowing again. Richard jumps out of bed and opens the door. There is Michael. "Good morning", he says, "there is coffee and biscuit at the dining area". Later there will be brunch about eleven or thereabouts.The sun is struggling to rise over Botswana; it is chilly but serenely beautiful. This is the red sand country of the Kalahari. The bushes are three, four metres in height. We can see the fence of the Botswana border: double fence, ten metres apart, three four metres high, disappears over the next rise, maybe three kilometres away. It is undulating sandy country, not unlike the Nullabor in Australia. There is a "pan", shallow large waterhole when it rains, but otherwise dry. I can see animals through the binoculars. Michael says they are Red Hartebeest and there are others as well. I mention the Lion I heard during the night and I am told that it would be over in the Kgalagadi Transfrontier Park in Botswana. We drive the border fence, looking for predator tracks in the red sand. This is an everyday task, to see if a Lion, Leopard or other predator has crossed the fence into the farm to prey on the domestic livestock, which is a smorgasbord for them. All the other property owners monitor the fence line as well on a daily basis. This is rather exciting for me. Back at the main house and we prepare to find the Kudu bulls. Michael, Richard, Johannes (Michael's tracker) and I into one vehicle and Hendrik and David (Hendrik's tracker) in the other, set out to look at the previous evenings tracks and follow from there. After about one hour of checking the tracks of the Kudu at the pan, there is a consensus of opinion that he is not injured. Although it makes me feel good, I berate myself for being incompetent in missing the shot. After some hours of driving, Johannes spots three Kudu bulls. These are not the first we've seen this morning, but Michael is determined to get me a shot at the same bull as I had missed the previous evening. We leave the vehicle and begin our approach to the bulls: Michael leading, myself following then Richard behind. This is how all our hunting will be carried out. Richard has the camera and will take pictures when possible. After a while we are able to approach the bulls, for Michael to observe and decide which one is from the previous day. I am in a position to take a shot, sitting in the sand, rifle over the shooting sticks; not real comfortable but a relatively stable position. The Kudu bull looks huge, at about one hundred and twenty metres uphill. Michael gives me the order to shoot and I take a clear shot. The Kudu bull bounds off and Michael says the shot was good. We wait a few minutes and then move to where the bull was and follow his tracks, maybe fifty metres, where we find the bull dead. I have a beautiful trophy. I am at once pleased and elated. 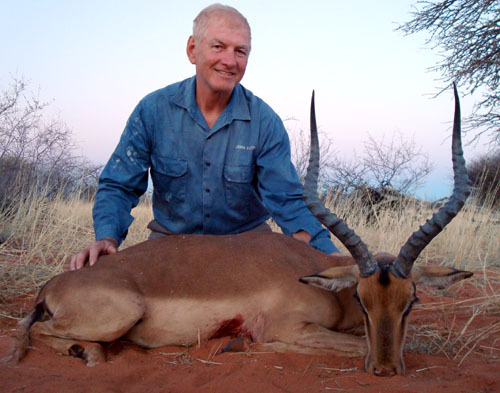 The 54' Kudu is one point off a NAPHA (Namibian Professional Hunters Association) Gold medal. This is the best Kudu taken on the property this year. I am elated, but sad he had to die. Michael assures me that the bull is about twelve years old and his genes are well spread through the herd and he is passed his breeding prime. The photos are taken and the bull is loaded into Hendrik's Toyota, not without effort by several people. We drive back to the house and the bull is prepared for the freezer while Michael does the caping and later the salting of the skin and head. This is important, to ensure a good quality trophy and Michael does this himself. Tienie is involved in the preparation and cutting up of the carcass. This initially surprises me, but of course she is a qualified master hunting guide and it is part of the job. 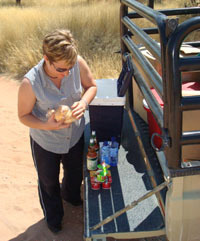 All the antelope meat is good eating, and nothing goes to waste. Over the coming days, we experience how good the meat is in the delicious meals that Tienie and Isabel prepare... two meat meals a day. We now have brunch, it is about 11h00 am. The food is superb and there's heaps of it. I wonder how we are going to be able to cope, eating so much. Mid to late afternoon and the Kalahari sun is starting to lose some heat, when Michael says "Let's go and find you an Impala Ram". We drive around for a while and locate an Impala herd with a good ram and some younger rams. We follow on foot in single file, not making much sound in the Kalahari sand, trying not to step on too much dry grass, or get caught by the thorn bushes, which abound. We make an approach on the Impala herd, but there are many keen eyes and ears, as well we have to be mindful of the wind direction. I think we made about twenty stalks and each time the herd moves, we follow. The afternoon is nearly gone, it will be sundown soon. We are sitting in the sand contemplating our next move, which maybe last for the day, when the Impala herd turns and begins to move back almost directly towards us as they graze. I have the shooting sticks and the rifle across them. Michael is watching for the ram in the herd and we wait. This is real pressure. I try to be as calm as possible, and not shake all over the place!The Impala are slowly moving past us, unaware of our presence, then the selected ram appears about eighty metres away, and Michael gives me the nod. I take the shot, the ram staggers, but does not fall. Nearer to us, one young ram jumps four metres over a thorn bush in fright and his feet dont even touch the bush. An incredible feat to witness. My shot ram now falls over and dies. He is a beautiful animal, his lyre shaped horns measure out later at twenty one inches... very nice. We have to move swiftly to take the photos, as the night falls with a glorious Kalahari sunset happening, and it will be dark on the veld soon. Hendrik arrives in time, having received a radio call from Michael. Michael carries a backpack at all times, with radio and water. It is hot enough to require plenty of water. The Impala is loaded into Hendrik's Toyota with ease. They are not big. On the drive back to pick up Michael's truck, I wonder how Michael and Hendrik find their way around with such ease, but I suppose they have lived on the property all of their lives and know it well.The slaughtering and caping is done back at Hendrik's house in purpose built facilities, with plenty of running water. Dinner is late tonight, as the Impala has to be properly processed and this work cannot wait. Incidentally Namibia has little surface water, except after rain, but then it soon evaporates, so the water is from the bores. It is of the highest quality and good for drinking. This is the reason why the country can support such large numbers of game, as well as domestic stock. It is well after eleven PM when we get to bed. I am elated, not only by the success of the hunting and the great trophies, but by the easy friendly manner of our hosts. This is truly the "African experience". 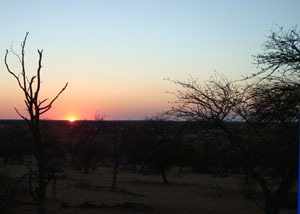 The Kalahari nights are cool with no traffic noise and we sleep well. Until. That "pesky rooster" is at our door. We greet Michael with "Alright we are awake now", and go for coffee and biscuits. Then into the Toyota to check the fence. The sun is up now and once again looking at the vista of Africa... truly magnificent. After some time we find the Gemsbok herd that Michael is looking for. The internal farm fencing is no obstacle for any of the antelope. They leap over it with ease so the herd can move anywhere, although they stay in a range of their own choosing. Once again we head off on foot, single file as usual. Michael is tracking the herd (I don't know how he does this as all I see are hoof prints, but he is good at tracking). There are about twenty animals in this herd; they have great vision as well as the other senses.After some time, Michael is able to ascertain that there is a very good bull in this herd and we begin our stalk. The herd runs off in a "cloud of dust". We try some more stalks with the same result. We then head back to have brunch at about twelve. After brunch we head back to the veld at one o'clock. No rest this time and the temperature is over thirty degrees. We drink heaps of water. The Gemsbok are running us around at will... they are in complete control. We are crossing our own tracks with greater frequency. Michael tells me the herd is moving in the classic figure eight shape. The sun sets and we find our vehicle and drive back to the camp for showers, drinks and dinner. 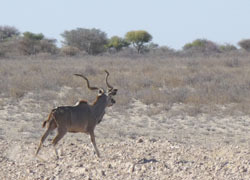 According to Michaels estimate, we have walked twenty kilometres today, following the Gemsbok herd. Not a chance for a shot at our designated bull. The Kalahari evenings are superb. You have to experience to understand and appreciate. Michael cooks the meat over a fire at the camp; he is good at this too. Antelope is as good as our kangaroo. We wine and dine, enjoy delicious food and talk over the days events. Tonight we have more time to catch up, as there is no slaughtering or caping needed. The evening is clear and the sky brilliant with stars. Then there is the silence which is awesome, broken only by night birds or an animal. I listen continually for a lion, but never hear one again after the first night when I heard a grunt. Next morning I beat the "rooster" out of bed, and go up to the viewing platform to watch the sunrise. The atmosphere is serene, the silence vast, as is the landscape. The platform is at roof height, and offers a panoramic view. To the east is the straight line of the Botswana border fence, disappearing over a rise a few kilometres away to the south; westward the rise is probably fifteen kilometres away. We head out again after breakfast; check the fence, no predator tracks (Michael had seen lion tracks in the sand on the Botswana side on one occasion while we were there). Once again we find the Gemsbok herd and follow in our usual style. Lunchtime comes and once again we have walked around for ten kilometres, no chance of a shot. This is the way hunting goes. At lunch Michael asks Hendrik to assist by driving a vehicle so that we are more mobile and can get out of the vehicle more quickly for a stalk, if unsuccessful then the vehicle can pick us up. We locate the herd again and follow their tracks, Michael tracking from the vehicle. After some hours and a number of failed attempts for a shot, the herd stops. Michael gets off the truck and I hand down the rifle. I am halfway down when two Gemsbok bulls step out from behind a bush, one hundred and sixty metres away, up a rise. Michael looks through the binoculars as I get ready to shoot. Sitting in the sand, rifle on the shooting sticks, he says "It's the second one", I confirm this and shoot. No time to lose. This is our first chance for a shot in two days. The Gemsbok herd bolt, but Michael says the shot was good, centre of chest, a lung shot. Since missing the Kudu bull, I am loath to shoot for a lower chest shot. We wait to let the herd settle down, rather than chase them. After a few minutes we move to follow the tracks and come upon the bull that is still mobile. I try a second shot and the bull runs off and we follow. Gemsbok Hunting, AfricaThese are solid tough animals, and it is another half a kilometre before we see the bull down. Michael is cautious; he does not allow me to approach until he is certain the bull is dead, which he is. Gemsbok is dangerous when cornered and one thrust with those needle-like horns can spear man or beast. The Gemsbok bull is a beauty, measuring 37' and heavy horns at the base. 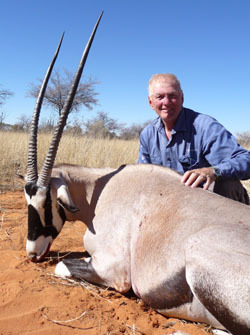 This animal scores a NAPHA gold medal easily, and is the best Gemsbok bull taken on Uitspan for the year. I am happy and my hosts are happy for me. I have taken all the animals I set out to hunt. That night we have our usual good food and wine and good Namibian fellowship. We are all on a high, especially me. Michael offers me a Springbok, free of charge. It would be rude not to accept this offer. I will just have to do some fancy explanation to convince Pam of this. On top of this, there is the matter of the Blue Wildebeest, which I am reliably told by Michael, it is the poor man's Buffalo and makes a superb skin, so I commit to the Blue Gnu for a rug. We rise with the sun next morning and after coffee and biscuits, check the fence. Richard is staying in camp today to do his own thing, so Tienie will join us for the hunt and take some video footage with our camera. We locate a herd of Wildebeest but only female and young. The females are pregnant and not for hunting. Soon we find a second herd, mixed with Gemsbok. This complicates our ability to approach for a shot. We wait, watching for an hour to see what develops. Michael does not see any bulls so we withdraw and search some more. After lunch Michael decides that the bulls must be with the females and Gemsbok. This proves correct, as the animals run off we see that there are bulls and the one mature one is our target. Michael and I follow and by about mid afternoon there is a chance for a shot. My line is interfered with by bush so I aim further back than I would prefer and take a shot. It's a hit in the lungs and Michael says he will run a long way. We follow the herd looking to put in the finishing shot. Michael receives a call from Hendrik on the radio. He has our bull in sight, on his own now. We locate the bull and I put in a final shot. He is a solid tough animal that takes a lot to put down. The skin is beautiful silver, black and darker stripes. On the way back to the house we come across a Springbok herd with a good ram, an old animal in its decline, so I collect my Springbok as well. The horns are thirteen and a half inches and what a pretty animal. 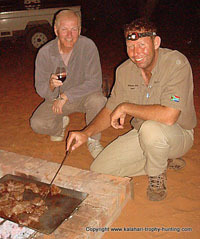 That night we celebrate my unforgettable time, hunting in the Kalahari with the Duvenhage family on Uitspan farm. They have provided an opportunity for me to hunt in Africa and I will always be grateful to them and regard them as friends. No "rooster" the following morning, no need to rise early so we miss the sunrise. We drive to Hendrik's house where Michael completes the trophy preparation and salting. He will deliver them to Reiser taxidermy in Windhoek next week. We leave Uitspan after our goodbyes. We could not have asked for a better time there. Michael and Tienie drive us to her brother Awie's farm after a short stop at her mothers farm which is next to Uitspan.Tienies brother will take us on a very special trip to visit a Bushman family who have a camp on his farm (this is about 50kms from Uitspan). We stay overnight in Awie's own camp next to the Bushmans. This is a privilege and we thank Awie who is a special person who cares deeply for the Bushman people in keeping their traditions. He does a great deal to help them. We meet the Bushmen family in the afternoon, the head of the family and his wife are in their late seventies and still very mobile. We learn of their traditional hunting, gathering life and listen for their click language. It is very hard to pick up. We have dinner in Awie's camp and in the evening we sit by the fire in the Bushman camp and watch the men dance to the singing and clapping of the women. Richard is invited to join the men dance, with rattles wrapped around their calves for the traditional dancing. It is a very moving experience. After not sleeping very well, my mind full of the day's experiences, I rise early to watch the sunrise. It is always special. We meet up with the Bushman again, purchase some of their traditional jewellery, hand made from ostrich egg shell, and take some more family photos, we head back with Awie to his house and meet Sonja his wife. She drives us back the fifty km to Hendrik and Isabels who then take us onto Windhoek, to our guesthouse Piccini, we arrive late in the afternoon. The following day we start our Thimbi Thimbi Camping tour with six other people and our two local guides. For the next twelve days we get to see and experience the best of Namibia: Namib Desert, Solitaire, Sesriem, Walvis Bay, Swakopmund, Skeleton coast, Spitzkope, Himba Village, Etosha Game Park, Waterberg Plateau and Okahandja with its large souvenir market, then return to Windhoek and back home to Australia. If you want to and are able, then go...!" What an excellent review. To have an opportunity like this is simply a great blessing. 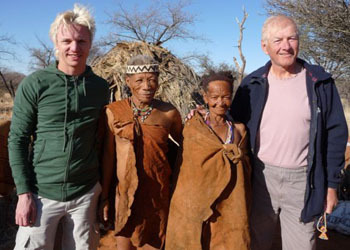 Not only the hunting, but also to be able to see the San people and see the farming operation must be really special. A once in a lifetime experience that I and my wife would love to have. Very, very detailed story. The description of the hunts were excellent but a bit daunting; 20 kilometers in one day through the red sand of the Kalahari makes you wonder about what kind of shape you have to be in to do this hunt. The whole experience sounded wonderful and one that any hunter and nature lover would want to experience. Uitspan here I come! !